Always wanted to change the colour scheme of the heatmap? Or do you need different colors to emphasize the importance of locations or negative values? Heatmaps are widely used to analyse and visualise density and intensity of data. E-Maps supports both heatmaps based on density and heatmaps based on a value of the data. 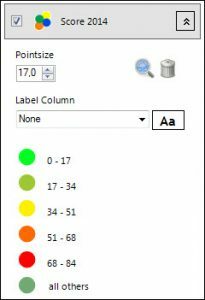 Adjust the colours, the ranges and display negative values. E-Maps has baisc heatmap functionality in all versions. E-Maps Pro has the additional value based heatmaps. 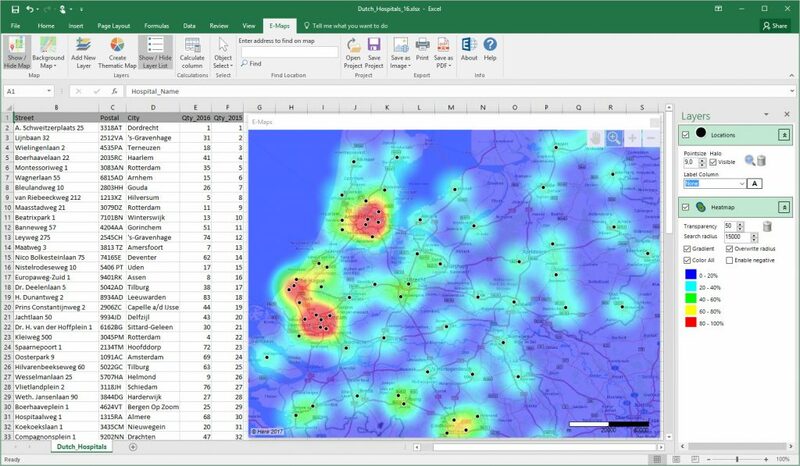 Discover the new specifications for heatmaps in Excel E-Maps. Dutch newspaper ‘Algemeen Dagblad’ has publicised her annual hospital test. You will find the results plotted on a map where you can find this years’ score in the outer circle and the results of 2013 in the inner. Explanation of the used colors: The redder, the worse, the greener the better the score. In E-Maps we used two thematic maps with different diameter on top of each other. Check our latest feature: thematic shading on your own imported map. 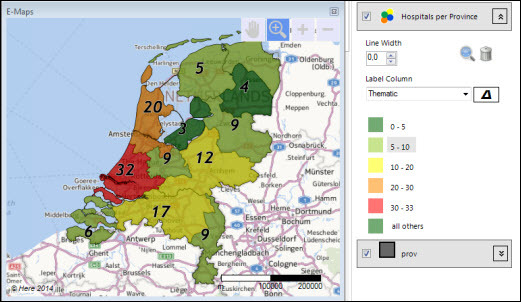 Import your own boundary map in shape format and join your data in Excel. Select the data in the Excel sheet and create a thematic shading. You may change the colours, the ranges and set labels. Last step is to share the results as an image or in PDF format.